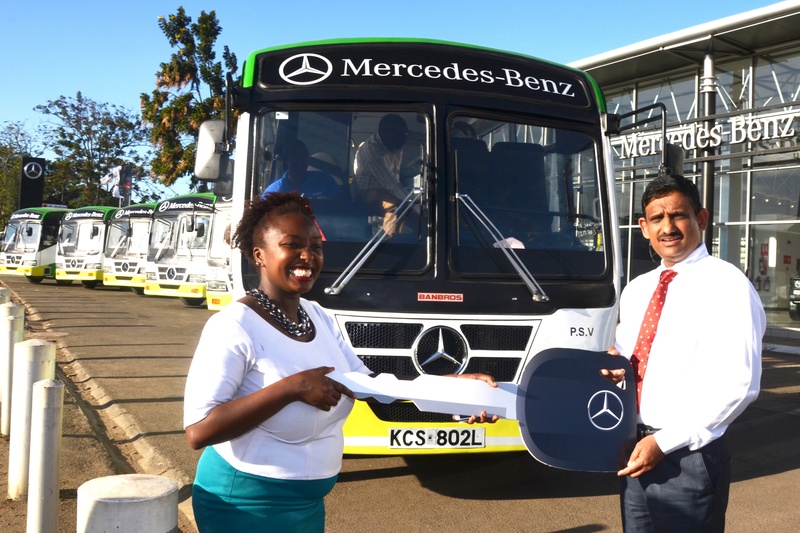 After purchasing six Mercedes-Benz MB-917 buses from DT Dobie Citi Hoppa has already deployed them on routes in and around Nairobi and they are available for hire within Kenya. The 41 seater buses were delivered to Imelda Karaya, the Communications Liason Officer of Citi Hoppa by Srinivas Cheruvu, the Finance Director of DT Dobie and Mohamed Tajdin Chatur, the General Manager Sales for Heavy Commercial Vehicles. Mohamed Tajdin Chatur said, “We are very grateful to Citi Hoppa for choosing Mercedes buses after a thorough assessment of the performance and specifications. Active safety features of the bus chassis include braking systems with ABS, precision steering and good road holding and comfort resulting from chassis and suspension systems specifically designed for buses”. Imelda Karaya commented, “This is another endeavor to provide customers with comfort and reliability which are the hallmark of the green and yellow buses that weave through our city. Citi Hoppa Next hopes to encourage the small vehicle owner to leave their car behind for this convenient, reliable and available service for a flat rate of 80 shillings”. “The buses will ply through the Mombasa, Langata and Ngong Road corridors to serve both offices and estates in those areas. With the well-trained drivers, conductors and ground customer services. Our new Kenya built buses exceed the specifications laid down by local regulations, meet the safety requirements of Daimler and have been approved as genuine Mercedes Benz products”, concluded Imelda. Previous article2019 Africa’s Richest Persons. Did any Kenyan make it?